Since the very beginning (1984), Stan has run the show at Star Liquors. From it’s origination as a convenience store’s sister business to it’s current 9,000 square feet of glory, he was there every step of the way. Stan’s pride in the business is evident in our well-developed and extensive wine selection, the top-notch staff we have worked to build and the customers who leave satisfied each day. Having honed his wine knowledge over 25 years of studying, traveling, and tasting nearly 25,000 wines, Stan’s passion for vino rests on solid foundation. His goal to thrill each customer is met with surprising regularity, so it’s no wonder he still serves some of the same clients today as he did in that first store several decades ago. Originally from South Bend, Indiana, Stan lived in Ohio until May of 1978 when he moved to sunny, beautiful Durango. He loves the people in this mountain town perhaps as much as he loves running, hunting and golfing in it. Stan is always happy to support local charitable organizations and sponsor community events around Durango. When he’s not at work or playing outdoors, Stan enjoys cooking, savoring great wine at home, reading and catching up on sports (Go Ohio State! Go Broncos!). Mikes interests include falconry, competitive dog grooming, streaking, mixology, leisure suits and croquet. He enjoys almost every type of libation as he believes “there is a time and place for any alcoholic beverage except Jagermeister and any wine with Cab Franc in it”. Mike’s dream is to become the next Dos Equis spokesmodel. Hello! I moved to Durango in 2001 and love it here! I’ve lived a LOT of poopy places and this ain’t one! My hobbies include snowboarding, paddleboarding, collecting unicorn tears [ SO HARD! ] & breaking balls. My favorite drinks are GREAT tequila & high octane IPA’s & oh! of course- BUBBLES! (the sparkling variety and the Furkid!) A few things that you might not know about me: I love watching BAD reality t.v.- just to see all the awesome stuff… (it WAS my dirty little secret) 🙂 If tequila is your jam, come find me– most agave products cross these lips before hitting the shelves. ( just to make sure they aren’t poisonous for our customers)! I have a Bachelor of Fine Arts with a concentration in Ceramics. Meditation has CHANGED MY LIFE. Lastly, I’m a well- documented badass– able to outride people half my age… and make it look easy. You’re welcome! What up? My name is Thomas Lee. Somehow with such an easy name, NO ONE can remember it! I often joke with my friends about how long ago I moved here from Connecticut, but I know I have worked for Stan for almost six years. I hate it here. The mountains, the slew of sunny days and the friendly people. I enjoy movies, drawing, computers, technology and snowboarding. “What do you mean you don’t have ice, I have to drink this coffee hot”? I have a Golden Retriever named Shea, and, if I am not in the building, I am most likely with her. I am also a HUGE Mets fan, and LOVE live music. Stan made me the Beer Manager about 2 years ago, but I still consider myself a member of the Night Crew. I am at the store until Bodrug tells me to go home. IPA’s, Barrel Aged Beer, Fine Tequila, Top Shelf Bourbon, and well Blended Reds are my top five. Come see me at the shop and talk about how our tastes compare and contrast. I love my job, and my job is conversing about Beer, Wine & Booze. Gavin was born on the planet Krypton. When not at Star he enjoys long walks in the rain, art, riding his bike, skating and staying fit. His favorite things about working at Star are the people and it’s a lot of fun. He likes a good Stout, IPA, Scottish Ale, Bourbon and some Chartreuse from time to time. Gavin is not a wine enthusiast, he feels it smells and tastes like something you should pour on a salad. If you need some SOLID bourbon/ whiskey/ or scotch advice– he’s your man! Nick is our go-to guy. Always good for a laugh and a smile. If it needs doing, just ask Nick and he will make it happen. He’s not only a great guy and lead, but he is fun at parties too. When he is not at Star, being a Star, you can catch him up at Purg shredding– really, shredding. His favorite drinks are IPA’s as well as tequila or a full-bodied cabernet. Nick is a FLC graduate, loves the weather in Durango, and the people. Gerry is a long time Durango resident. You might know him by his popped up collar and the whiff of Old Tymer’s Cafe. He is a fan of walking his dogs, biking, hiking and travel. Originally, Gerry was Swiss, but gave up his dual citizenship when he was 18. Look him up the next time you are in Star and ask him for some wine advice. He is very good at suggesting the perfect wine! Natan (like NATHAN without the ‘H’) has worked at Star two different times. We fell in love at first sight and after 5 months, he went and toured the world with his wife and a program called Up With People. Thankfully, he missed us enough and came back. Obviously, he’s originally from Brazil, but he’s been living in Durango for more than 5 years. Natan’s favorite thing about Durango is how everyone makes an effort to be outside- whether it be skiing, biking or whatever the elements allow. In his free time he enjoys playing soccer, cycling, PICKLEBALL, and an occasional Netflix binge watching marathon. Natan enjoys beers of many styles, Very high-end tequila (think Don Julio 1942 and Herradura Ultra Anejo). When not boozing it up, he enjoys FREAKSHOW cabernet and some nice pinot noirs. If you haven’t met him yet- he’s the guy with the great accent. Evan is fortunate enough to be a Colorado native. He was raised in Bayfield where he grew to love the Great Outdoors. Most of his free time is spent fishing, backpacking, kayaking or skiing. After getting married in 1998, he and his wife foolishly (his words) moved to Washington state. Thirteen rainy years later, they returned home to dry out. Evan has been with Star since July of 2017 and we are thankful! He said he didn’t know what to expect working here but quickly found a sense of comradery that is both rare and infectious. (Plus, we get these super-secret spy radios!). He specializes in eating cabbage, enjoying Bourbon, stout beers and zins at home with his lovely wife and furbabies. Barry’s been with Star since February of 2017. In the summertime, you can find him making all the greens pretty up at Dalton Golf Course. Catch up to him on his tractor-if you can. He and Tamara have been giving each other jobs for so many years now; starting at Purgatory a long time ago and now they are reunited. Carmine is the guy that comes in at night and leaves under the cover of darkness. Originally from Long Beach, New York, he’s been living in Durango for almost 40 years. His favorite thing about Durango is the people. His specialty here is giving great customer service and seeing friends from his tenure at Purg as well as making new ones. His hobbies include photography, making lamps out of liquor bottles, cooking, skiing and surfing his Kubota. He doesn’t have a multitude of favorite beverages- just Old No. 7 – that’s Jack Daniel’s if you aren’t in the know. *** Stay tuned for more information on some of the new people: We have Bryan, Amanda and Casey K ( back for Round 2)! In 1984, Esther and Hayes Crapo and their children, Sue and Stan purchased Huck Finn, a small grocery and liquor store on Florida Road. Stan was in charge of the operation, and after ten successful years, he built a Texaco Convenience Mart and closed the old grocery, keeping the liquor store open. In 1998 Stan moved the 1,000 square foot liquor store to a new 3,000 square foot location across from the Texaco and renamed it Star Liquors. A year later, he added 1,100 square feet to that store, and finally moved in 2008 to our current, spectacular 9,000 square foot location. 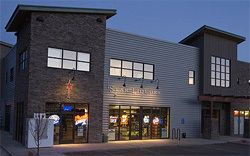 Throughout Star’s history, it’s owners and operators have focused on diversity of stock, customer satisfaction and employee team building, so far a winning recipe for this friendly neighborhood liquor store and wine destination.